This entry was posted on April 30, 2018 by Mari. 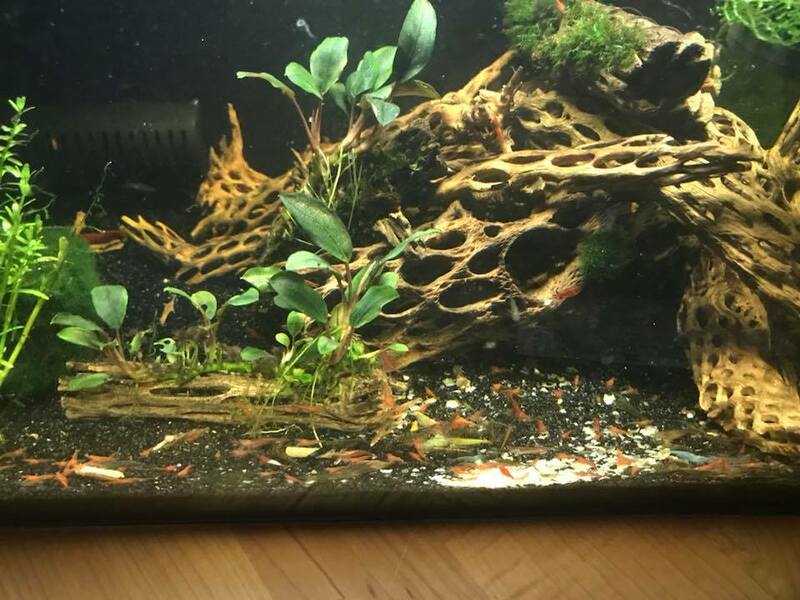 Looking for an easy but decorative plant for your shrimp tank? 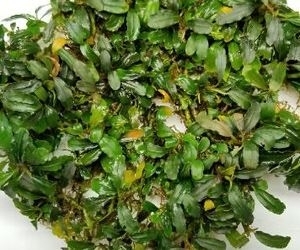 Bucephalandra, also known simply as Buce, might be the right one for you. But be careful... many an aquarist has become addicted to collecting the endless Bucephalandra varieties! 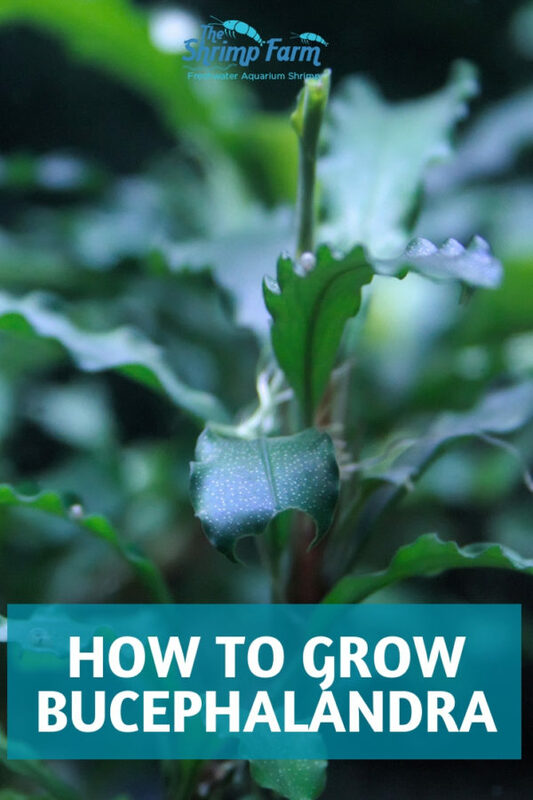 Looking to get into growing your own Bucephalandra? This caresheet contains everything you need to know about caring for this versatile aquarium plant. 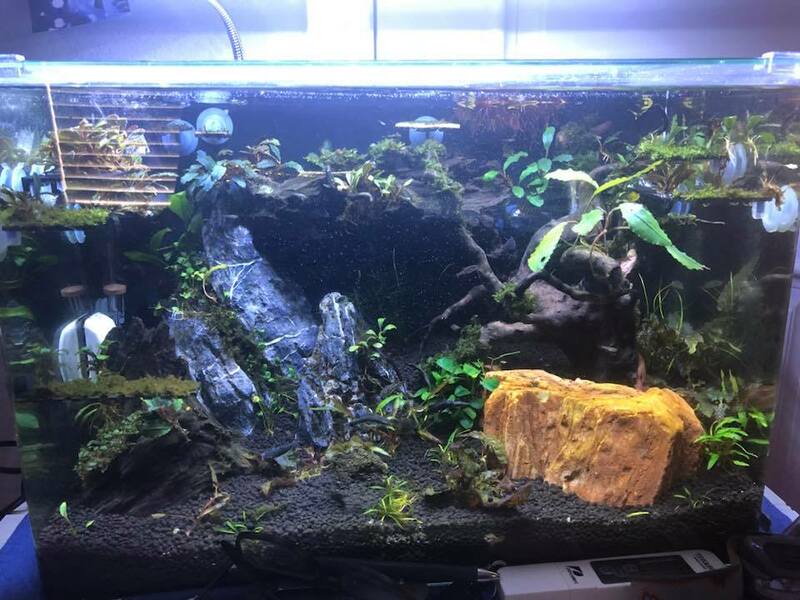 And why are so many aquarists around the world obsessed with this little plant? Bucephalandra is a rheophytic plant that naturally occurs in Borneo, where it grows in fast moving rivers and streams. In order to avoid being swept away by the current, it has evolved the ability to strongly anchor itself on rocks and other surfaces. The water level in its natural habitat varies, which means this plant is underwater for part of the year and above the waterline the rest of the time. It can handle growing both submersed and emersed, which makes it a great option for aquariums, paludariums and terrariums alike. Although there are only three officially recognized species of Bucephalandra, the amount of 'unofficial' Buces is immense. New varieties are always being discovered and exported from Borneo, which has resulted in a bit of a taxonomic mess as different sellers might give different names to the same variety. At the same time, this huge variety of plants has made collecting Bucephalandra all the more fun and exciting. Photo by David B. Pineda. 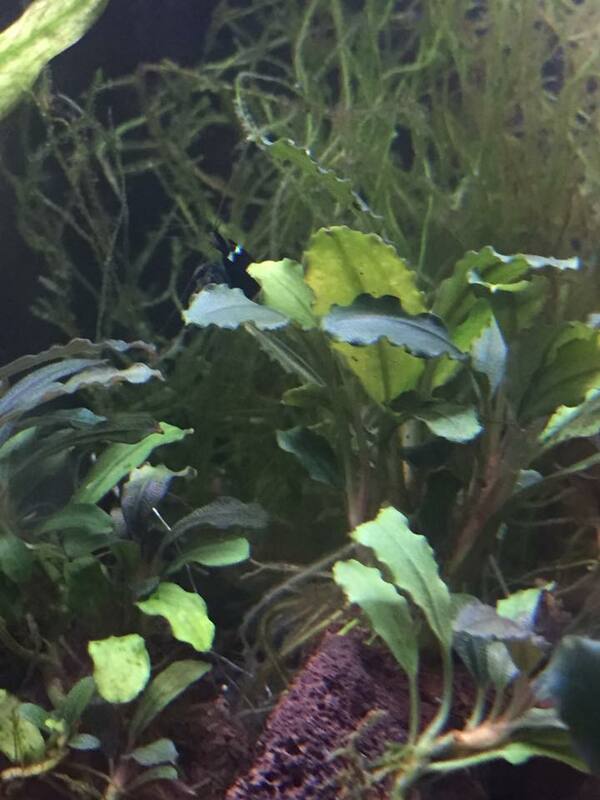 Looking into getting your first Bucephalandra plant? You're in luck, this species is not difficult to grow at all. It's beginner proof and doesn't need large amounts of light or specific care. The most important thing to remember when it comes to growing Bucephalandra is that this plant naturally grows on rocks and other surfaces. It's not used to being planted in fine media like sand. Instead, it's a good idea to use coarse gravel or attach your Buce to a piece of coarse rock or driftwood. This is not difficult at all: just use some rubber bands or super glue and the plant will do the rest of the work. It will be nearly impossible to separate from its surface within a few months! You won't need a lot of light to keep your Bucephalandra healthy. Although the plant's colors and growth will be better under medium to high light, a slightly more dim environment is not a problem. The same thing goes for dosing Co2 and nutrients. Although your Buce will appreciate this and reward you with faster production of new leaves, it will also do just fine without it. 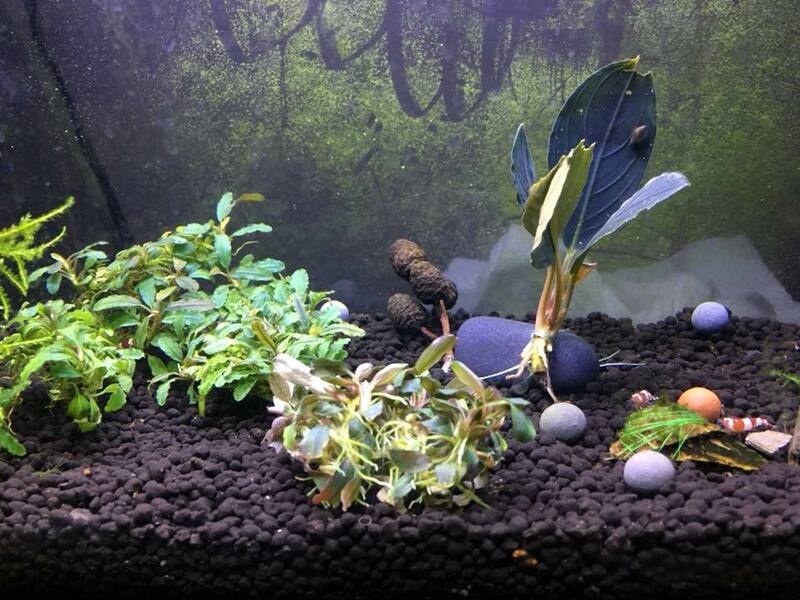 Having trouble with your new Bucephalandra being cranky and dropping leaves? Don't worry, it's normal. It might have been grown emersed and is having to adapt now that you've placed it underwater. Any changing conditions can cause leaf loss, but as long as everything else is fine your plant will recover without any further issues. Bucephalandra is a widely appreciated choice for both aquascapes and 'regular' aquariums. The fact that it can attach to rock or driftwood makes Bucephalandra suitable for creating 'underwater trees' or decorative planted rock scapes. Most Bucephalandra varieties stay quite small. In fact, some are downright tiny! This makes it the perfect plant for a nano aquarium, which is also one of the reasons so many shrimp keepers love growing this plant. Propagation: Wondering how to turn one Bucephalandra into more Bucephalandras? It's not difficult at all. In fact, the plant will do most of the work for you! A healthy Buce will naturally grow baby plants and form dense clumps over time, although this can take a while due to its slow growth. To propagate your Bucephalandra, simply disconnect one or multiple plantlets from the mother plant using a sharp knife. You can then reattach this new plant wherever you want to get a new clump going. Although more varieties are being discovered regularly and many aquarists have started to collect Bucephalandra, it's still a relatively uncommon plant in the hobby. If you head out to your local aquarium store you might not be able to find it. Luckily the Internet is here to help. There are plenty of hobbyists out there selling a few Buces here and there. Online aquarium stores might also carry this plant - The Shrimp Farm has recently included multiple varieties of Bucephalandra. You can buy your Buces, including some rarer varieties, in our store here. Want first dibs on new freshly imported Bucephalandras that haven't been listed in the store yet? You can join the TheShrimpFarm.com Buce Preview Buy Page group on FB to see our new additions before anyone else does. 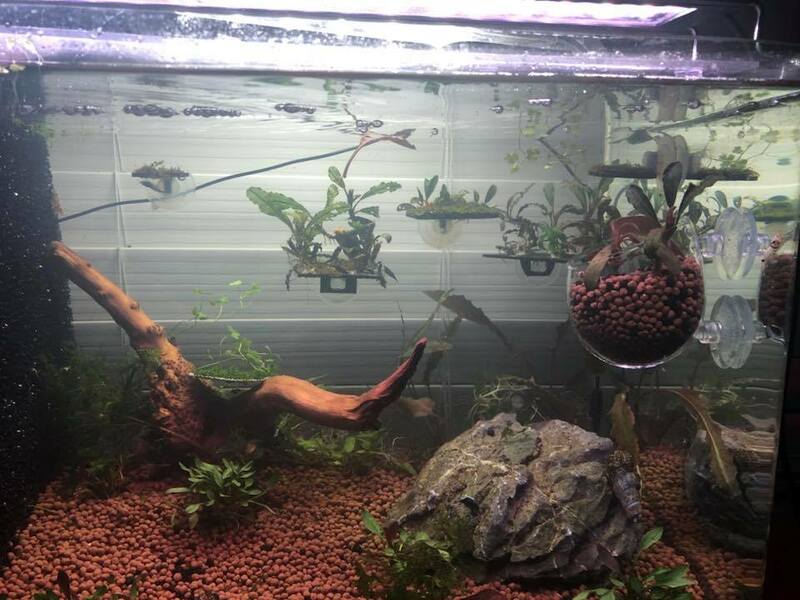 Note: A big thank you to the members of the Buce Preview Buy Page for kindly sharing your Bucephalandra photos to use in this article.